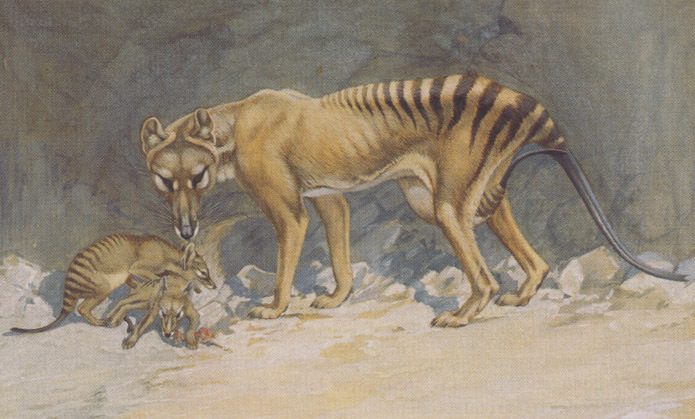 A 1902 painting by Joseph Gleeson depicts a thylacine mother with her cubs (photo courtesy of Smithsonian Archives). The thylacine (Latin name: Thylacinus cynocephalus), sometimes called the Tasmanian tiger or "marsupial wolf", was a predator that looked much like a large dog and had stripes like a tiger. However, it was actually a marsupial (notice the third cub's back and tail protruding from the mother's pouch in the above painting). Thus, it was more closely related to kangaroos and koalas than to dogs or tigers, though unlike kangaroos (but like most other Australian marsupials), their pouch opens to the back, not the front. In recent history it was found only in Tasmania, though in prehistoric times it also lived on the Australian mainland. Tragically, this magnificent species became extinct in 1936, when the last known one died in a zoo in Tasmania only about 130 years after the species' first encounter with European settlers. This was recently enough that there exist movies of zoo specimens. There are still occasional unconfirmed reports of thylacine sightings in the Tasmanian forests, however few if any scientists believe there is any chance that the species survives. A 2006 story reports the existence of 714 known (dead) thylacine specimens. Unfortunately, efforts to preserve thylacine specimens were spotty. The exquisite Smithsonian specimen that we sequenced is at one extreme; however a book by Robert Paddle reports (page 232) that the Tasmanian Museum failed in 1936 to preserve the last thylacine, and the year before had destroyed five mounted specimens. *Sally Bryant and Jean Jackson Threatened Species Unit, Parks and Wildlife Service, Tasmania (1999). Tasmania's Threatened Fauna Handbook, Bryant and Jackson. pp. 190-193. ISBN 0-7246-6223-5.